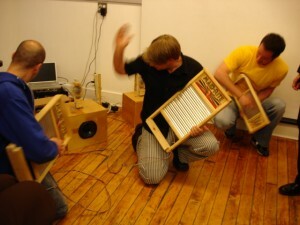 Unusual Musical Instrument Jam: Friday, March 12! It’s that time of the month again: time to gather together all of the loud things that you have and bring them to Pumping Station: One for an evening of fun! This Friday, March 12, at 7pm, Pumping Station: One is hosting its monthly Unusual Musical Instrument Jam! We’ll be running it synchronously with i3Detroit again this month. As always, we welcome anything that makes noise…bring your electronics, your toys, your common household items, even your musical instruments if that’s your bag. If it’s loud, we’d love to see and hear it! The event is open to the public, and free.